The Cuisinart CTG-00-CB16 is a 16-piece cutlery and tool block set. It offers ease and convenience of having all their essential knives and tools. The wide range of stainless steel knives makes quick work of any cutting task and includes a sharpening steel to maintain their extra-fine edges. The heat-resistant nylon tools feature slotted or solid heads to simplify preparing and serving food. The set is housed in a handsome rubberwood block. 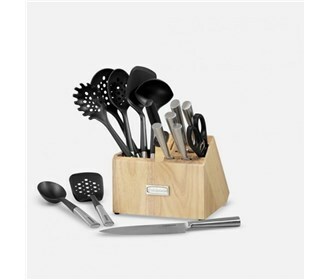 The Cuisinart 16 Piece Cutlery Block & Tool Crock Set has many exciting features for users of all types. 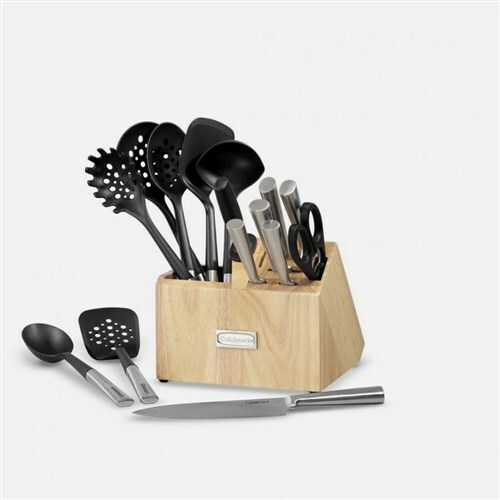 See the Cuisinart 16 Piece Cutlery Block & Tool Crock Set gallery images above for more product views. The Cuisinart 16 Piece Cutlery Block & Tool Crock Set is sold as a Brand New Unopened Item.